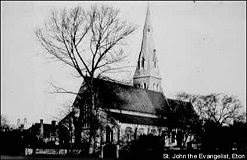 Eton Wick History: St John's, Eton and the Great Victorian Marriage Mix-up. St John's, Eton and the Great Victorian Marriage Mix-up. Imagine a whole generation of respectably married Victorians waking up to discover that they weren’t officially married at all. In 1875 this was the situation facing more than two hundred couples thanks to an administrative mix-up at the new church of St John the Evangelist, Eton. The church was an over-large building with a bleak undecorated interior, designed by Benjamin Ferry and built by public subscription. Prince Albert laid the foundation stone on October 21st, 1852, and two years later the church was consecrated for services of worship. The new church was viewed at the time as a Chapel of ease, which meant that it was an adjunct to the Eton College Chapel, the Parish Church. Because of this no Vicar was appointed to St. John's but three College Chaplains took services there on a week by week rotation. The status of only being a Chapel of ease was to have an unexpected significance and perhaps amusing consequences later for a number of parishioners who married there during the first seventeen years of its existence. The local authorities had taken it for granted that the new church was automatically licensed to lawfully solemnize marriages and from 1858 to 1875 223 couples took their vows in St. John the Evangelist and started out on life together believing they were legally married. Imagine the surprise and consternation when Diocesan officials discovered the error. With urgency the Bishop of Oxford introduced a bill into the House of Lords to legalize those past marriages, and rushed it through both Houses of Parliament in one night. When the story broke the residents of Eton must have wondered upon reading their morning paper whether or not any of the "married couples" would have taken advantage of the easy opt-out this presented if they had known of the error. As the Bill was passed with such speed any who would have wished to avail themselves of the legal loophole had no chance of so doing. It has been said that the theatre play “When we are Married” by J.B. Priestley was based on this incident. The play features three couples celebrating their silver anniversaries who learn that the parson who married them was not authorised to perform weddings: technically, these pillars of the establishment have been living in sin for a quarter of a century. In 1989 the church underwent structural alteration to become a multi-function building comprising doctors' surgery, Eton College Sanatorium, flats for College personnel and a chapel.